Brita Borg (1926-2010) was a versatile Swedish performer whose career spanned fifty years. Her material was often comedic and even self-parodying. She was a variety artist, a pop star of the Fifties and, in later years, an actress in stage musicals and operettas. Horror fans will note that she appeared briefly as a dance hall singer in the 1959 Swedish giant yeti film known alternately as Terror in the Midnight Sun and Invasion of the Animal People. 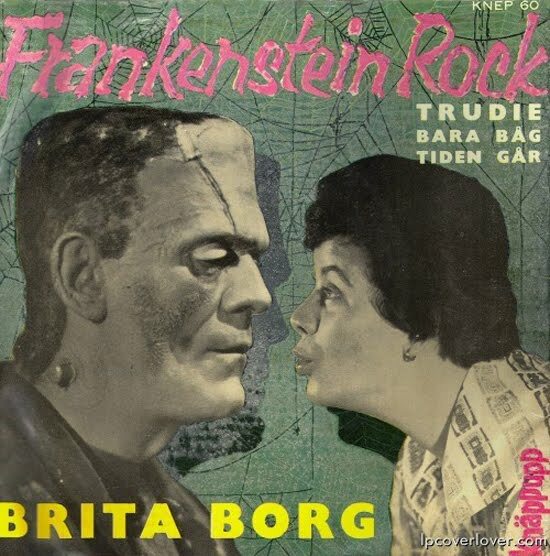 Frankenstein Rock was a novelty hit released in the monster boom year of 1958. The record sleeve (courtesy LP Cover Lover) is a quick and dirty paste-up of Borg and Boris in his Bride of Frankenstein getup. The song is a basic, commercial, Bill Haley-type rock ‘n roll number. What a great song! Basically, the narrator of the song is singing about going to see Frankenstein with her boyfriend at the movies and how scared it makes her. ("I get cold and I get goosebumps/You'll have to hold me for hours after".) She promises her boyfriend that if he protects her from Frankenstein she'll be "very good to him." Draw your own conclusions. The song was written by Beverly Ross and Lee Morris, so I'm guessing it was first recorded in its original English version. Furthermore, the Borg version was released late, in December of '58. Thanks for the info and the spotlight on this lesser-known version!